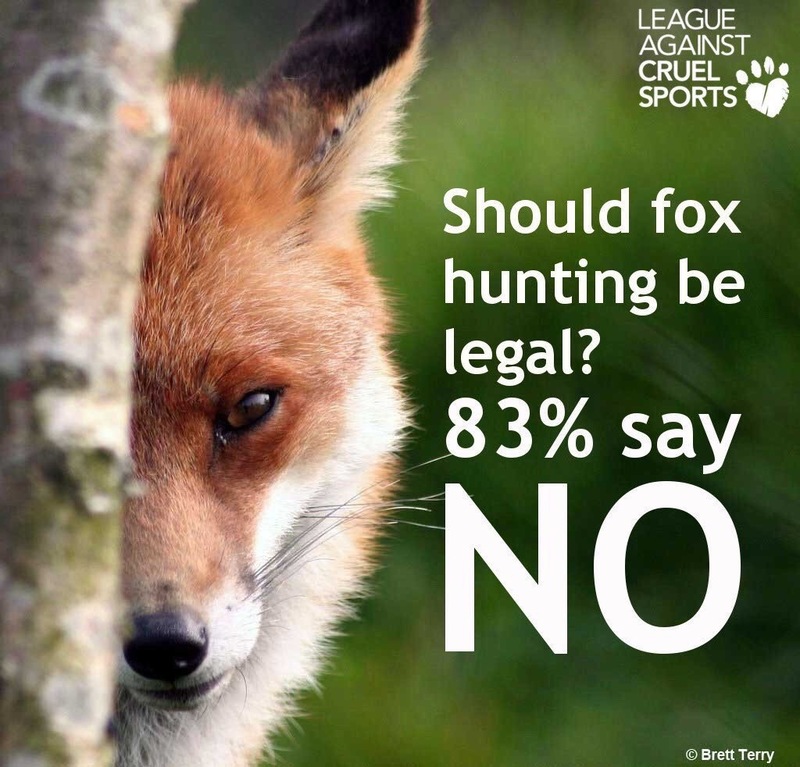 #KeepTheBan on fox-hunting, for foxes’ sake! To follow my previous blog on fox hunting, firstly, I’d like to thank all the people who sent me lovely responses. Hope and compassion are alive and people are active against the ban, and that is very reassuring. I have tried over the years to calm my passionate nature over this issue and I now attempt to demonstrate calm logic. It is difficult not to be angry where violence against a living creature is the central issue, but I have found that people seldom listen to arguments which involve fluffy animals and are more likely to respond to cool facts. Of course, this argument is flawed as, if we were to substitute a different animal- a pet cat, a horse, people would become outraged and quickly validate their anger. However, I am always happy to revert to logic. I have also tried to be compassionate towards people who hunt: I don’t accept it as either their right or their culture, but I avoid calling them ‘scum’ and other emotive insults as it doesn’t provoke positive discussion between equal partners. I have been on the end of some fairly nasty anti-sabbing behaviour in the past where I was abused at the hands of hunters and where there was no discussion, of course, but that involved only a few individuals and it is interesting to see that the courts are now prosecuting people who attack anti-hunt protesters. That is how it should be according to the law: hunt saboteurs should never be at risk for protesting against bloodsports. It would be even better if there were no protest because there was no fox hunt. 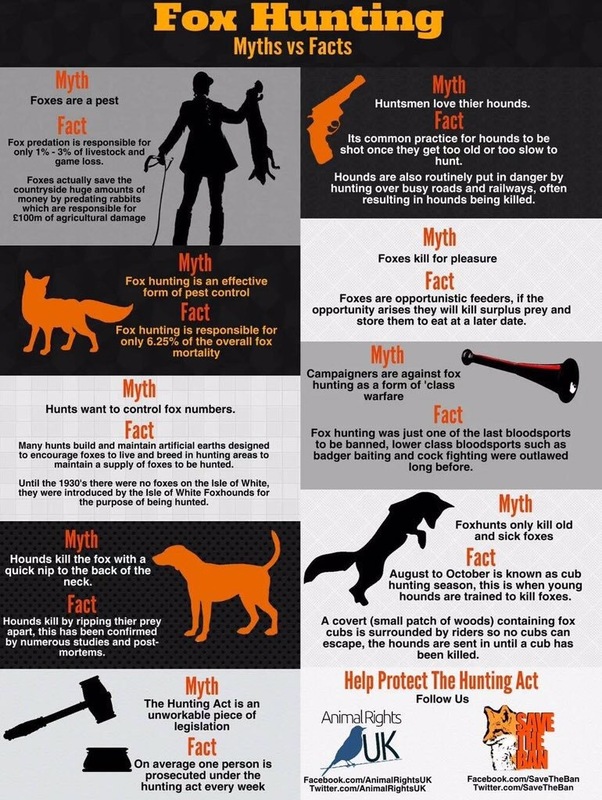 I have dealt with this issue in my blog: allowing the hunters to have ‘fun’ without killing an animal is possible. I am not a kill joy but I am also not a killer. I thought, rather than make further arguments myself on this blog post, I’d attach some very clever statistics and facts, below, which put a rational argument in place. Of course, most people who will read this blog know these facts already. But wouldn’t it be great if… imagine, if… someone who was on the side of the hunt read it and actually had the strength of resolve to change their mind. Thanks for reading my blog and thanks for keeping the faith. I get so angry over this . I don’t understand why these so called hunters aren’t arrested? And showing their kill with smiles on their faces. I wish there was so.ething I could do to help stop this cruel act.